An exquisitely carved ram's head on a large pot in the gardens of Peterhof Palace near St. Petersburg, Russia. There are choices you make every time you make a photograph that determine not just the look of the picture, but also its feel. Mood is an evocative tool that provides the ability to elicit a strong, emotive response from your audience. Photographs that communicate feeling and mood are always the ones that have the greatest impact and are remembered most. Let’s look at the above photo, made in the grounds of the delightful Peterhof Palace near St. Petersburg in Russia on a bright Summer’s day. 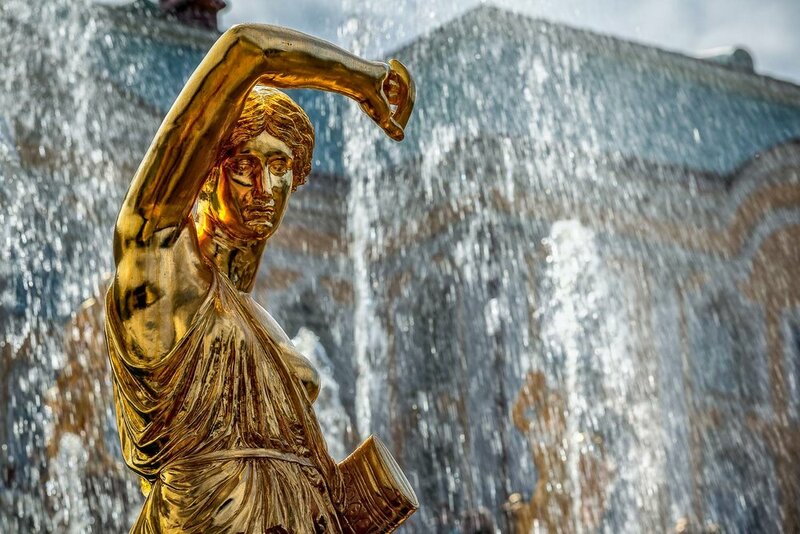 The grounds of Peterhof are famous for there splendid fountains and for all manner of statues, including the brilliant golden ones around the Grand Cascade. I noticed this particular sculpture, by the side of a path, while walking around the gardens. I was immediately drawn to the distinctive nature of the carving on such a large piece. I decided to contrast the two. Here’s how I went about making the photo. A long time ally of the landscape photographer and painter, side lighting emphasizes shape and texture. In the above photo it’s the shadow that enhances the three dimensional shape of the rams head and the other decorations on the sculpture and, as a result, really helps it to stand out from the surface of the structure. Lighting effects the performance of your lens! By enhancing the difference between light and dark, on the edges of individual shapes and textures within the sculpture, the strong side light also provides the impression of enhanced sharpness. This photo was made from, what can be described as, a worms eye point of view. By crouching and photographing upwards I was able to monumentalize the sculpture and embed it with a greater sense of power and prestige. I feel this one, simple non-technical move is critical to the success of the photo. Bright light can present a range of problems for the photographer. Bright subjects and surfaces are reflective by nature. I remember how the bright sun reflected tone and texture off the surface of the foreground sculptures and the pavilion and tees in the background. The resulting glare was both off putting and detrimental to the success of the image. The solution was to employ a polarizing filter to remove the reflections and, thereby, maintain all those delicate tones and details. It worked a treat and demonstrates how a polarizing filter can be a great advantage to photographers working outdoors under bright light conditions. Let's return to the image at the top of this post. The sculpture itself is largely colorless and, as the trees were backlit, their leaves also displayed very little color. In fact most of the color in the original image was in the blue sky and, while it looked good, it drew attention away from the sculpture. Converting the image into black and white was the obvious choice. The blue sky, darken by the use of the polarizing filter, now serves to frame and draw your eyes towards the lighter toned sculpture. But when there's color it's usually best to embrace it. 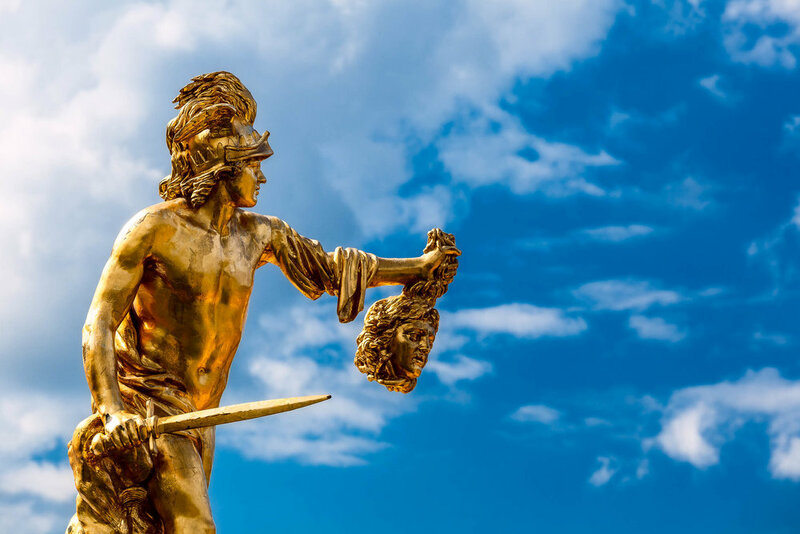 Take a look at this photo of a warrior holding the head of a victim in the grounds of Peterhof Palace. The vividly colored golden statue is enhanced by the cool blue of the sky behind it. It’s amazing how a simple subject or scene can so easily be rendered in line with your own creative vision. A few simple approaches applied while making the original image, together with a bit of fun on the computer, and you can end up with a photo that is far removed from the so-called reality that other visitors would have experienced when passing by that very same object or scene on that very same day. It’s your world and, as a creative soul, you have the ability to see and render that world in whatever way you choose. Through photography and the power of social media, you can share the beauty of your own, unique view with the world at large. Exploring your own artistic potential is both creatively satisfying and spiritually enriching. The problem for most folks is that they're simply overcome by the complexity of their camera. As a consequence the camera becomes a physical barrier between their creative self and the world around them. And that's just nuts. My view is that your camera, rather than being a barrier to experience, should be a passport that brings you into worlds outside of your own, individual everyday experience. Many of the most interesting relationships I've formed during my life's journey have come about through photography, and I want your own experience of the world to be as rich and broad as possible. But to get there you first need to take control of your camera. And that's where I can help. A 3-hour commitment and some ongoing practice, for folks who live in or around Melbourne, Australia and you're there. My advice to you is to consider carefully and act decisively.